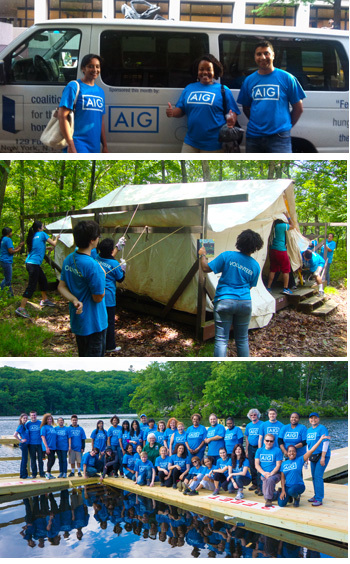 AIG joined the Coalition as a Premier Corporate Sponsor in May 2013, generously funding three Grand Central Food Program (GCFP) vans and sending 10 homeless girls and boys to Camp Homeward Bound (CHB). Employees of the company have also leapt right into the action themselves, coming out on the GCFP vans to help hand out meals to homeless people on the streets of NYC, and bringing a little elbow grease up to CHB for the busy Camp Clean Up Day. We greatly appreciate the help from AIG, its employees, and all those who have chipped in to make sure Camp Homeward Bound is as welcoming, inspiring and comforting as always for the hundreds of kids who so desperately need it. If you would like to learn more about how your company can get involved, click here. New Video and Recap from Carnival Night! Carnival Night for Kids is always a magical event for kids and adults alike, and this year was no different. Despite weeks of incessant rainfall, on June 12th the skies miraculously cleared and gave us a beautiful summer evening of sunshine and warm breezes. Victorian Gardens in Central Park was alive with games, carnival rides, magic shows, face painting and delicious food. Thanks to all of our generous sponsors and nearly 500 guests, we raised over $166,000 for the Coalition’s youth programs: Camp Homeward Bound summer sleep-away camp and Bound for Success afterschool program. Check out our Facebook page for great pictures of the event, as well as the Bosco Photobooth site for more fun shots of our guests! As you’ll see, the new dunking booth and Gaga we pit added this year were huge hits! We’d also like to extend a special thank you to Weitz Studios for making us this wonderful video that captures the fun and excitement of the night! If you were unable to attend the event but would still like to support the Coalition’s youth programs, please go here. “I’m sorry, school’s over. We can’t help you.” This is the line I heard over and over again last week, as I called schools in NYC trying to get them involved in the 20k Kids Campaign. As the development intern at the Coalition for the Homeless I was put in charge of raising awareness about the 20k kids campaign and recruiting schools to participate. Once someone picked up the phone, I would ask if their school would be able to help us out in getting more signatures. However, the administrators that I reached in the main office always seemed very unenthusiastic. I quickly realized that it was unrealistic: expecting a school to get a couple hundred kids to sign a petition within the last two days of the year. So, I decided to stop my search for the willing public school, and instead move on to summer programs. The first program I called was Ramapo, a day camp 40 minutes outside of the city that many New York kids attend. The staffer that I spoke with seemed excited about the petition, and asked how his camp could get involved. I explained that we would send hard copies of the petition, which he could put up in a central place, such as the dining hall. That way, during lunch, kids could go up and sign it. It wouldn’t be mandatory, but encouraged. I also mentioned that I could send some 20k “swag”, including bracelets, stickers, and pins. From there, I called many more summer programs, including Chelsea Piers Camp, LIU Brooklyn Children’s Academy, and Prep for Prep. Since most of these programs were just starting for the summer, the people in charge were more willing to introduce the petition, as opposed to the public schools that were just finishing. But once the petitions go up, it will be up to the kids to choose if they will sign it or not. So kids, how can you take a stand? How can you help? Well, lets say you go to one of the summer camps we have reached out to. You’re eating lunch, having fun with your friends, and then you spot the petition hanging up on the wall. It’s there, but are you going to go sign it? Yes, you decide you will. You get up to take a look, and your friends say “Hey! What are you doing?” You ignore them because you’re reading the petition statement, and then you write your name, grade, school, and borough. You call your friends over, “Com’ere! It’s a great cause!” And they come over. At first they’re apathetic; they don’t really have any interest. But once they read the statement, they’re signing and calling everyone else over to sign it too! Now you feel great because you know that you just helped homeless kids your age throughout the city. You can go home tonight to your own bed, but they have to sleep in a shelter, crammed in with many other people. You have just raised the number of signatures on this huge petition, and gotten us one step closer to getting homeless children out of shelters and into real homes. Twenty-one thousand. There are over 21,000 children – students just like you and me – living in NYC homeless shelters. They need your help. Sign the petition. P.S. 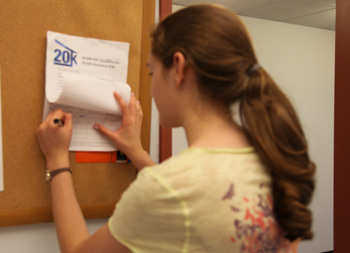 If your camp or summer program isn’t involved – let us know or ask them to join the 20k Campaign yourself! We are happy to send any materials and information they need to start getting signatures as soon as possible!